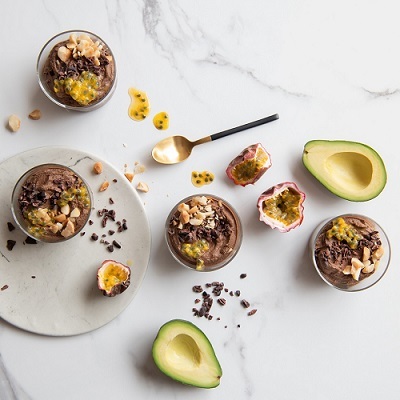 Avocado and chocolate may sound like a strange combination, but is definitely worth trying. The creamy avocado is a healthy substitute for dairy products that normally add a smooth and luxurious texture to desserts like this. Using avocado as a dairy-free alternative, along with the nuts, makes the dessert filling enough so that even a small portion is satisfying. The granadilla adds a surprising zesty flavour to this indulgent chocolatey treat. 1. Pour 80 ml (⅓ cup) of the boiling water over the macadamia nuts and allow to stand for 15 minutes. In a separate bowl, soak the dates in 45 ml (3 tbsp) of the boiling water for 15 minutes. 2. Add soaked macadamia nuts and dates with the soaking water to a food processor. Blend until a paste forms. 3. Meanwhile, melt the chocolate in a glass bowl over a saucepan of gently simmering water. Stir until completely melted and remove from the heat. 4. Mix the cocoa with the rest of the boiling water to form a paste and add with the melted chocolate to the food processor. Blend until smooth. 5. Add the avocados and blend until well combined. Stir in the granadilla pulp and spoon into 4 individual serving bowls or glasses. Cover and refrigerate until needed. 6. To serve, sprinkle nuts and cacao nibs over each dessert and top with a spoonful of extra granadilla. Serve immediately. 1. Roasted macadamia nuts: roast whole macadamia nuts in the oven at 180 °C for 10-15 minutes until golden brown. Take care as they can burn quite quickly. Alternatively, chopped macadamia nuts can be toasted in a dry frying pan, without any oil. Toss through once or twice to prevent burning. 2. If fresh granadillas are not available substitute the granadilla in the dessert with ½ x 115 g tin granadilla pulp. Serve as above.